At R&B, we use state of the art video technology to locate blockages, defects, or breaks in your line. We also use a line locating system so we know exactly where the problem lies making it easier to fix. The video inspection and locating system allow for precise identification and location of the issues, letting us get it right the first time. 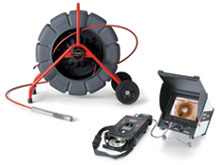 This system can also identify the potential for future issues in your drains and sewer systems, so you can avoid costly damage before it happens. Call R&B for your drains, we can help 604-980-1369! Great job, reasonable cost, professional service. Thanks.